In this photo released by U.S. Fish and Wildlife Service, coral is seen off Jarvis Island, one of seven islands strung along the equator in the central Pacific Ocean, in this photo, date unknown. It's part of the remote and uninhabited Pacific island chains first set aside by President George W. Bush as national monuments to protect them from oil and gas extraction and commercial fishing in what will be the largest marine conservation effort in history. Coral reefs that have been ecologically degraded give off a chemical cue that drives away fish and new coral, according to a study published today in the journal Science. 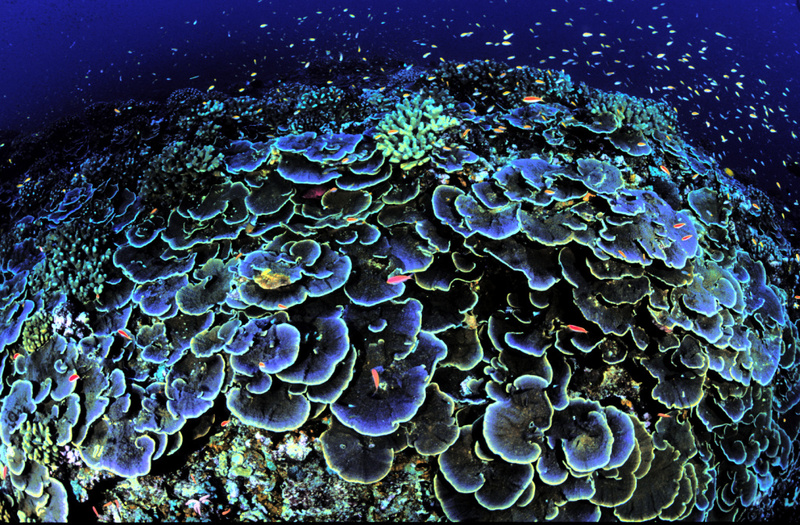 Researchers say, this effect can create a negative feedback loop that hinders the coral recovery process. The repulsive cue comes from certain species of seaweed, says study co-author and Georgia Tech marine biologist Danielle Dixson. Normally, seaweed levels in coral are kept in check by fish who love to eat the plant. But when humans overfish a reef, they take away the seaweed's natural enemy allowing the plant to spread. Dixson says, not only are these seaweed species toxic to adult coral, "they actually are producing kind of a seaweed smell." Through lab studies, her team determined that this smell drives away young coral larvae and some kinds of fish. This shows, she explains, that rather being at the whim of the currents, coral actively chooses where it wants to settle. She says it makes perfect sense that coral would be picky about its surroundings since once a coral is lodged on the ocean floor it will stay put for hundreds of years. "If they pick the wrong spot they are just going to die," Dixson said. Coral reefs are a crucial habitat for many different species, says co-author and Georgia Tech professor Mark Hay. However, he notes that there has been a 50% decline of coral in the south Pacific due to pollution, over fishing and other factors. Hay says this new study suggests that simply creating a marine protected zone around a recovering reef may not be enough to help the area bounce back. Instead, he suggests physically remove the "stinky seaweeds" in order to make an area more attractive to baby fish and coral.